CHERRY Rondina doesn’t know what her height is and couldn't care less that she is short by volleyball standards. “Five-six? Hindi ko po alam eh,” said the University of Santo Tomas volleyball player with a smile. Despite her petite frame, the 18-year-old Cebuana has managed to stand tall and get noticed, which was not easy considering the UST Tigresses had another disappointing end to the UAAP women's volleyball season. Rondina bagged MVP honors in her rookie year when UST beat National University to take the UAAP beach volleyball championship then continued her fine play with the Tigresses in the six-a-side game. Not bad for the Compostela, Cebu native who started out in athletics but soon realized she had the natural ability to excel in volleyball. “Athletics po talaga ako. Running po ako. Tapos one time po, nag-hagis ‘yung mama ko ng bola sa akin, naglaro kami nung Grade 3. Parang ‘yung service ko, dig pass talaga. Tinuruan na po ng maayos para matuto ako sa volleyball. Nagbunga ‘yung mga pinaghirapan ko,” said Rondina. From those time she started playing volleyball with her mother, Rondina was immediately hooked to the sport. “Nagustuhan ko po kasi team sport po,” Rondina said. 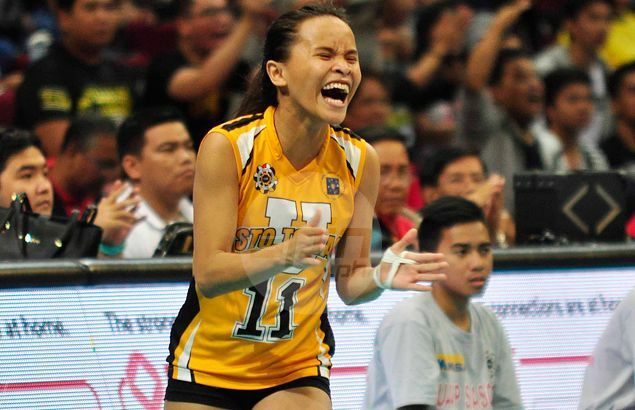 In a sport where giants rule, Rondina said she is not bothered having a smaller frame. Instead, she tried to epitomize a motto the team adhered to. All the hardwork and determination soon paid off for the Cebuana rookie, who was none more impressive than in UST's do-or-die match against the Far Eastern University Lady Tamaraws for a place in the stepladder playoffs. With the Tigresses down two sets to the Lady Tamaraws, Rondina energized the Tigresses as she attacked relentlessly to help UST force a fifth set. She even became a trending topic on Twitter at a time when UST was mounting a comeback. UST’s comeback, however, fell short and Rondina was blocked by the taller Geneveve Casugud for the game-clinching point in the Lady Tamaraws' 25-21, 25-15, 20-25, 16-25, 15-6 victory. The Tigresses have now missed the Final Four for the third straight year, but Rondina is ready to bounce back next season. "For me, we will do lahat next season. Alam ko pagsubok lang po ito sa amin. Alam ko na everything happens for a reason. My plano si God. Pray lang po and be happy,” she said.